There are moments when you forget all the wonderful foods there are to eat and all you want is bread. And butter. And maybe a cup of tea too. At the moment bread is off the menu for me. Its just over a month away from my sister’s wedding where I am maid of honour, and I have a dress to fit into. * Its always what you can’t have that lingers in your mind and tempts you from the righteous path of just having plain yogurt and apples for lunch. 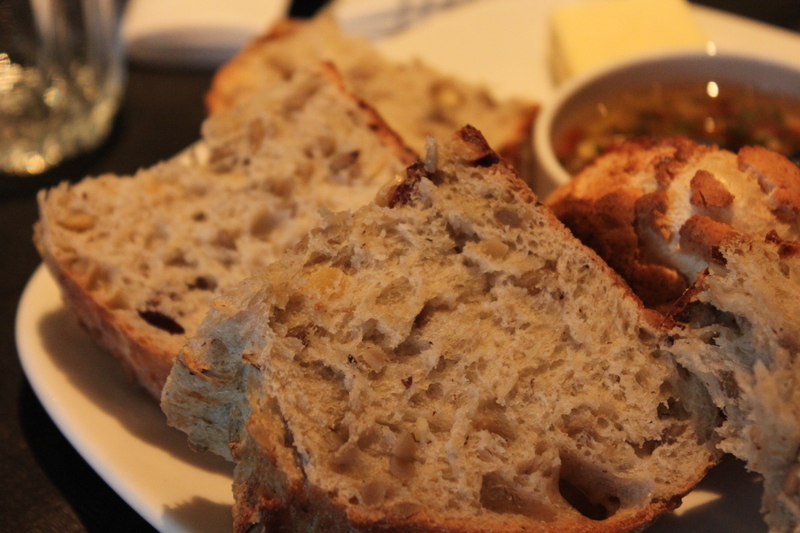 This entry was posted in Musings, Travel and tagged amsterdam, bread, butter, cau, food, gaucho, hazelnut, hazelnut bread, organic food on September 3, 2011 by Our Little Organic Life. 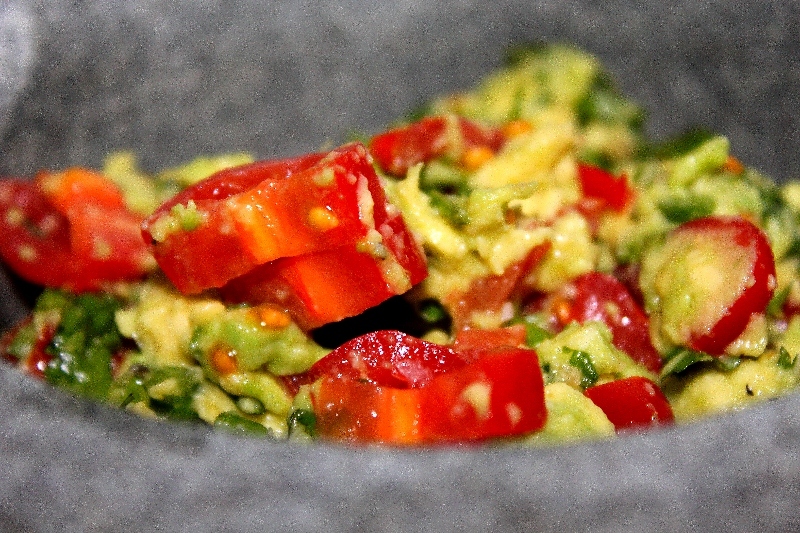 There are as many ways to make guacamole as there are Mexicans to make it. Everyone (and their mother and their dog, etc) has their own way of making it, which of course, is the best way. Some guacamoles are runny, green and whizzed through the blender, so they’re smooth and pourable. Others are chunky, with roughly mashed hass avocados and juicy, ripe chopped tomatoes studding it like jewels. Some have white onions, cilantro (fresh coriander for those in the UK), parsley, jalapenos, garlic or lime juice. I’m a fickle guacamole maker. I’ll use whatever I happen to have that’s delicious and fresh…and happens to be in the house. The only essentials as far as I’m concerned, are a really nice ripe buttery hass avocado and a fresh plump jalapeno. If I happen to have cilantro and juicy baby plum tomatoes hanging about in the fridge, then that’s all the better. Beta-sitosterol: This inhibits the absorption of cholesterol and promotes lower blood cholesterol levels. Folate: Promotes healthy cell and tissue development, so it reduces the risk of birth defects if you’re pregnant. Potassium: Helps balance the body’s electrolytes. Ounce per ounce, avocados contain 60% more potassium than bananas. Vitamin E: An antioxidant which slows down aging and protects against heart disease and various forms of cancer. Glutathione: Acts as an antioxidant to neutralize free radicals that can cause cell damage and lead to disease. Lutein: This protects against prostate cancer and eye diseases such as cataracts and macular degeneration. Magnesium: Helps produce energy and is important for muscle contraction and relaxation. Method: Cut the avocado in half and scoop out the buttery flesh. Roughly mash it with a fork, or if you’re lucky enough to have a molcajete**, give it a gentle mash with with the chopped cilatro, sea salt, pepper, and jalapenos. At the very end, gently fold in the tomatoes and squeeze the lime over the top. I’m not too keen on a lot of lime in guacamole, but a little bit cuts through the fattiness quite nicely. *In Canada and the US, we call this fresh herb cilantro, for the Spanish name, but in UK its called fresh coriander. 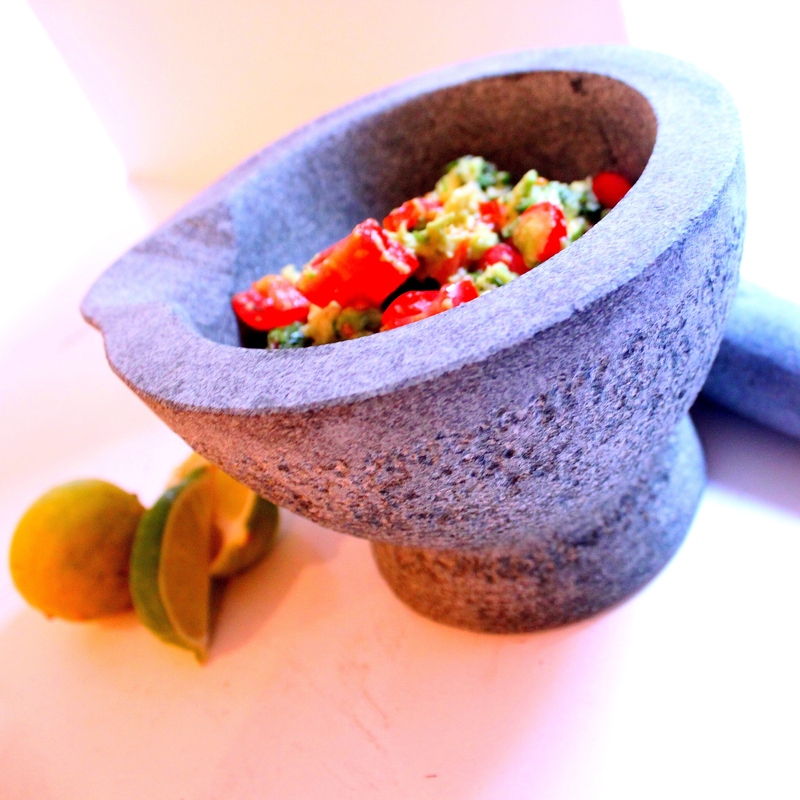 **A molcajete is a Mexican mortar & pestle made from lava stone. This entry was posted in Mexican, Recipes, Travel and tagged avocado, avocados, cilantro, food, jalapeno, lime, mexican, mexican food, mexico, organic food, photography, slow food on August 17, 2011 by Our Little Organic Life. It was well over 35 degrees Celsius and our pink English skin was only now, after 3 days in Agadir, beginning to take on a golden tan. We had planned to walk to the top of the hill to visit Souk El Had, but instead, after a mere 5 minutes of slowly sweating & shuffling at a snail’s pace, Luke decided we were taking a taxi. We were dropped off by gate 9, as the concierge at the hotel had recommended to us. I think he was afraid we’d be dropped off by the butchery halls otherwise, and run away in terror. 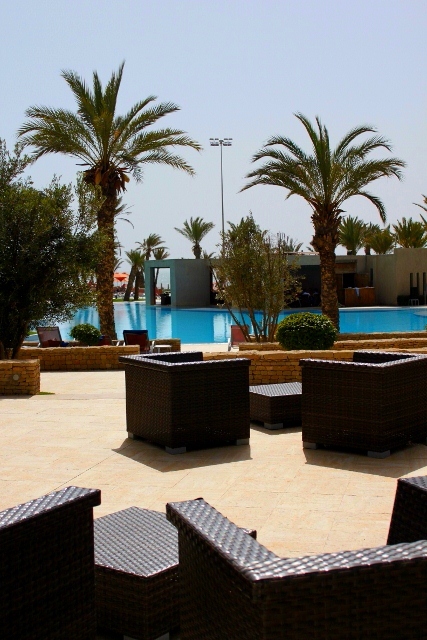 By this point I had already grown accustomed to being served silver pots of mint tea by the pool all day long, and large glasses of freshly pressed-to-order orange juice with my breakfast. In the evenings, before dinner, Luke and I would meet on the terrace and have a gin & tonic with a small silver platter of pistachios or the black dried Moroccan olives that smell of petrol and perfume. I was deeply falling in love with the food of this country. The fish was fresh and plentiful and cooked beautifully. The tables and tables of mezze at lunch and dinner had much to do with the demise of my diet. And what’s not to love about somewhere that serves madeleines at breakfast? I was eating the best of North Africa and the best of France in one heavenly beachside location. We had finished looking at the touristy part of the souk and by now I was getting a bit bored of alleyway after alleyway of shops selling argan oil, kaftans and gaudy leatherwork. I looked up from playing with the new silver bangle Luke had bought me a few moments earlier, and the small crowded alleyway suddenly opened up into a bright and sunlit food hall. I almost stopped breathing for a moment. I think it was the closest I will ever come to seeing what Les Halles in Paris would have been like before it was demolished and turned into a trendy shopping centre. For those of you who, like me, make a beeline for the food markets when you travel, you will be accustomed to the sickening pong of rotting food that generally hits you from at least one corner of the market. It’s normally where cabbage leaves and bits of turnip go to die and are scavenged upon by scabby feral cats and stray dogs. But the smell was absent. The first smell that hits you is of the glorious mountains of fresh mint. Along the edges of the market hall, towering arrangements of gleaming olive mosaics in polished agate shades sparkled in the sunlight and piles of mysterious red, orange, yellow and brown spices delicately scented the air. We walked back down the hill to the hotel that afternoon, drawn in by the smell of salt and the slight ocean breeze off the Atlantic. 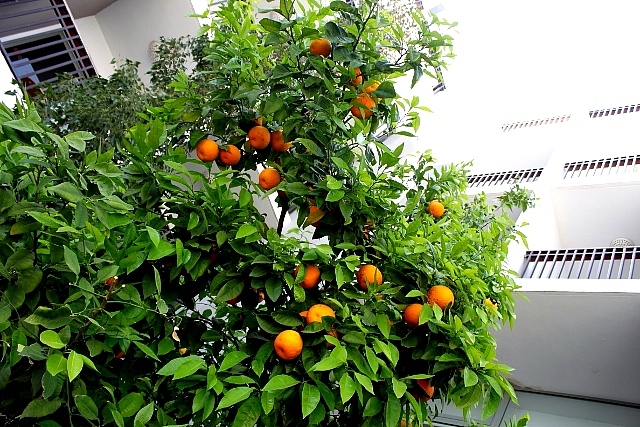 We knew a plate of pistachios and chilled bottle of rose awaited us on the terrace, but we were in no rush; calm from the soporific effects of too much afternoon sun and pacified by the smell of mint for tea and a mountain of oranges. This entry was posted in Musings, Recipes, Travel, Uncategorized and tagged agadir, food, gin & tonic, mezze, mint, mint tea, moroccan olives, morocco, north africa, olives, oranges, organic, organic food, photography, pistachios, rose, souk, souk el had, souks, travel on July 28, 2011 by Our Little Organic Life.